The post Self Expression is Overrated prompted some reflection on the often heralded “hands-on” “interactive” self-expression panacea for involving visitors. In a thoughtful essay, starting from data provided by Forrester Research (graph above) Simon explores how the bulk of museum visitors wish to be spectators and directed in their experience. The post Deliberately Unsustainable Business Models takes off from a comment by Eric Siegel, the Director of the New York Hall of Science, on why museums tend to be behind the innovation curve because as “non-profits, museums are built to survive, not to succeed.” With the current economic downtown Simon explores the impacts of this approach. 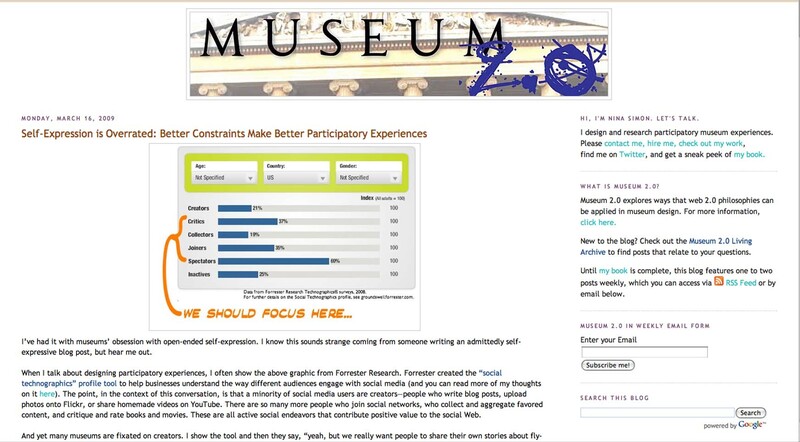 Other posts take up examples of Museum experiences with Web 2.0, from the Minnesota History Center to the Smithsonian Institution;Introduction to basic Web 2.0 tools such as Twitter, Wikis, Voicethread and more; and discussion of some basic tools for transitioning staff and colleagues to Web 2.0. The most recent post consider types of Role Playing in the Museum. Nina also writes a column for Museum, the magazine of the American Association of Museums and is currently completing a book on the participatory museum experience. What are your experiences with Web 2.0 when it comes to Public Outreach?